If you are considering precious metals as portfolio insurance, buy only PHYSICAL silver and gold. If you have the actual bullion in your own possession, you have no third-party risk. The best form to buy is the form that will be easiest to use during turbulent markets. Easily recognized coins and bars can be traded anywhere in the world. FIRST STEP: Silver is survival currency. Buy new U.S. 1 oz silver dollars and old U.S. 90% silver coins (dimes, quarters, halves, and dollars). Small denominations could be used to barter for goods and services. 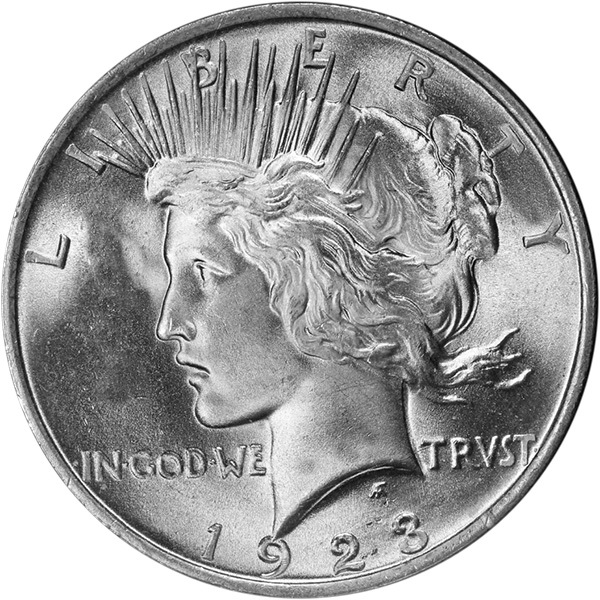 American Silver Eagle coins are exactly 1 oz of pure silver. 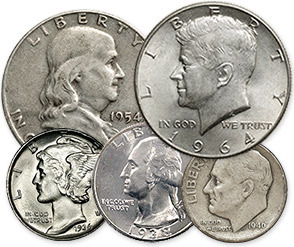 Pre-1965 U.S. dimes, quarters & half-dollars are 90% silver. The silver coins are called “junk silver.” They are sold in bags ($1,000 face value), half-bags ($500 face), quarter-bags ($250 face), & ($100 face). 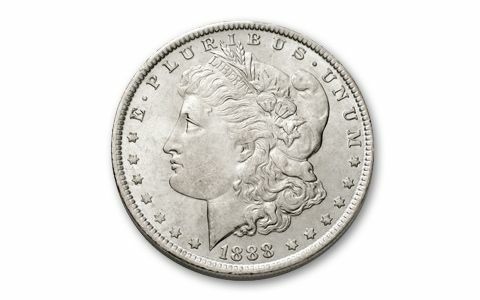 U.S. silver dollars (minted before 1935) are a very good idea (Morgan or Peace dollars above). You just need more money to buy the old coins (premiums are usually higher). Canadian Silver Maple Leafs are exactly 1 oz of pure silver. SECOND STEP: Gold is portable. 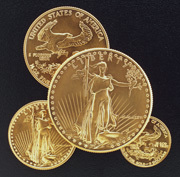 Buy gold “bullion” coins (new) and pure gold bars -1/10th, 1/4, 1/2, & 1 Troy oz. Smaller denominations of coins and pure gold ingots are available. Maple Leafs are recognized everywhere. Kilo bars are popular in Asia (32.151 Troy oz each, .9999 pure gold). Small American Gold Eagles are great (1/10, 1/4, & 1/2 oz). FINAL STEP: Buy platinum, palladium, and U.S. silver and gold numismatic (rare) coins. These investments are not for everyone — the more exotic or rare an investment is, the less liquid it is when markets are disrupted. However, there are very good reasons to buy each category of precious metals and coins. Platinum is a rare, strategic metal. Platinum is now a very good buy. Many investors prefer antique U.S. coins. When Americans realize how rapidly the dollar is losing purchasing power, people will scramble for actual coins of silver and gold. While U.S. markets are orderly, take possession of PHYSICAL gold and silver. You may choose to convert a percentage of your entire portfolio with a one-time purchase, or cost-average with even dollar amounts over consecutive months. REAL MONEY provides ultimate liquidity. Silver and gold coins in your possession is portfolio insurance that you control. About 75% of world gold production is flowing to China. Since the 2008 crash, China’s record-demand for PHYSICAL gold has periodically caused shortages and delayed deliveries. The above PDF includes articles on NAKED SHORTING: Gold and silver prices are suppressed by massive sales of PAPER gold and silver (contracts representing millions of ounces are dumped simultaneously in London and New York). Concentrated short-selling is coordinated by the trading desk of the Federal Reserve. CONTENTS: Ancient Monetary Weights: TALENT, MANEH, SHEKEL, GERAH, BEKAH; TROY Weights; METRIC Weights; CARAT Weights; KARAT Purity; MILLESIMAL Fineness; FAR EAST Weights; British POUND (Pennyweight, Pound Sterling, Sovereign); DOLLAR (Old U.S. Gold Coins); Historical GOLD-to-SILVER RATIOS (U.S. 90% Silver Coins, Gold & Silver American Eagles); BIBLE Weights (Conversion Table); WORLD COINS (Gold Contents).